One and all struggle with focus. In a hyper connected world where any and all distractions are available at One’s finger tips, the ability to focus becomes more difficult as society emphasizes entertainment over enrichment. Screens small and large keep One from turning that last page, doing the last rep, typing the last period, or starting the first sentence. When a multi-task approach is promoted as thee most efficient, it is easy for One to believe that if we master multi-tasking, we’re making more time, and doing more. When in fact, all that One is perfecting is the art of half done ideas, and put off projects. Instead of proud achievements, One produces postponed deadlines and goals unmet. On ever-growing lists of to-do, it all seems possible since One can download in a flash, or dial with the swipe of a screen. But, since our fleeting thoughts can be met with an instant way to indulge, we do just that–and lose momentum towards self-fulfilling goals that require our full, undivided attention. 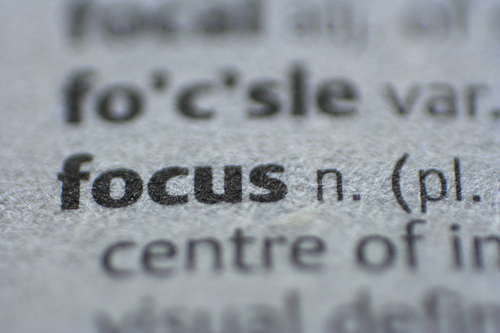 We are not developing habits of efficiency, but rather reinforced ways of losing focus. We’re doing less with more. We must ditch the delusion of it all being possible from our hand-held devices. It would do us better to use our hands for what is most important in the moment–like savoring the last bite, or getting that guitar chord down. One really cannot afford to compromise. What is conceived as compromise is not a meeting in the middle, but rather both sides not reaching what was really wanted. And in the end, all One wants is that their life’s greatest work was done, and that they were happy doing it. The only way in which it does, is not through the fastest, but through the most focused. perfectly put. timing couldn’t have been better for me, either.